I've disassembled, lined, and reassembled the trunk, which was about as difficult as expected. 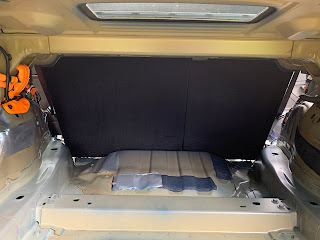 It was about 4-5 hours of work all in all, no major unexpected problems, and I actually ended up doing significantly less work and using significantly less sound dampening material than I expected due to the car's fairly good built-in insulation. It's not particularly difficult to remove the trunk liner, though it does require you to remove the rear seats completely. I would have done this anyway. 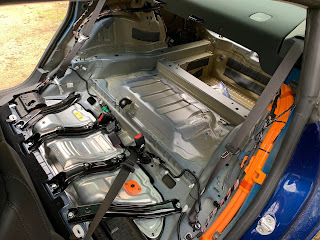 What surprised me was how much insulation is already included on the trunk liner. 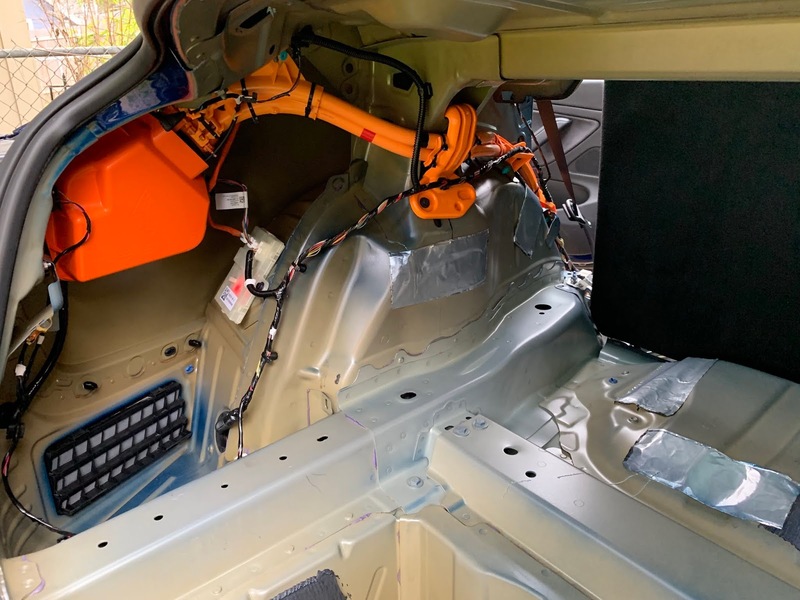 The rear motor is directly below the front half of the trunk, and so all three parts of the trunk liner (floor, right wall, left wall) already have very large, thick pads of foam/vinyl insulation. The foam is anywhere from half an inch to two inches thick and the vinyl layer (or something similar to vinyl) is about 3/32". This might be standard in luxury vehicles, I honestly don't know. When you drive the car with the trunk liner and especially the rear seats removed, it's obvious how much noise this material is already blocking. When I recently spent several hours riding in the back seat, I wouldn't have guessed there was a 250hp motor two feet away from me. With everything removed, it's pretty obvious. 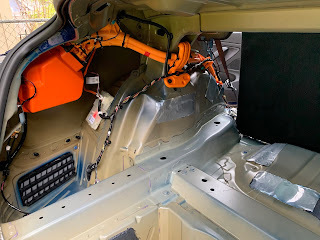 Since I already have perfectly form-fitting foam/vinyl insulation covering the louder half of the trunk, I'm not even going to bother adding in more. 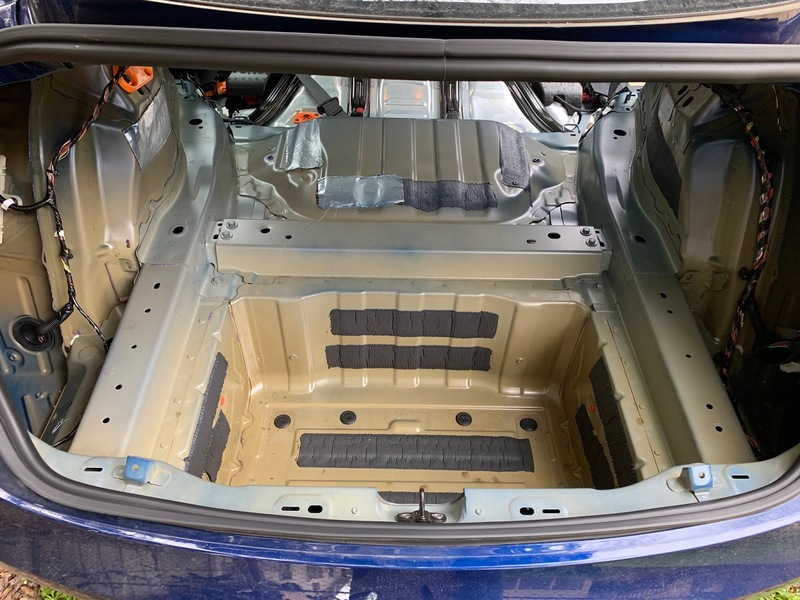 You can see that the body panels are sporadically lined with butyl for vibration dampening, but it's a bit sparse so I am going to double or triple that coverage. I did an almost solid layer above the rear motor and over the wheel wells. I'm planning on putting three small amps in the trunk well, and I haven't decided how I'm going to mount them just yet. They're class D so I don't expect significant heat generation, but I also don't want to put them on top of the regular liner, because that would provide significant thermal insulation. 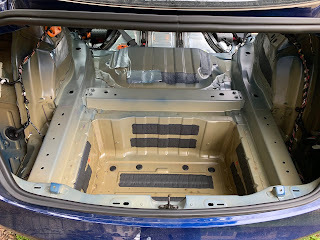 I might cut the bottom out of the liner inside the trunk well and mount them directly to the frame with adhesive, then either create a new liner above them or trim the liner around them. Either way, I want them to be fully covered, invisible when I'm done. 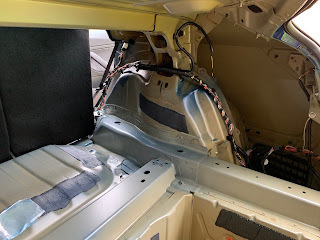 That's about the only thing left to figure out in the trunk. 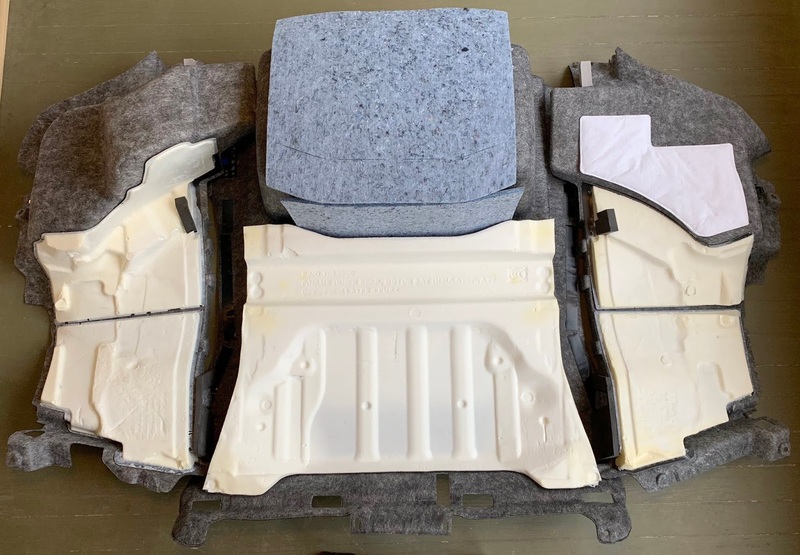 For anyone who needs them, here's an overview of the disassembled trunk.